These titles, among many others, are geared toward all different age groups for children, with about 20,000 of the 30,000 books targeted for the 3-5 child age range. 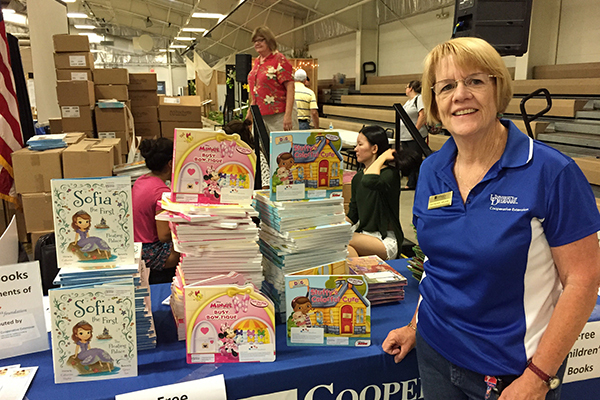 Older youths are encouraged to read these preschool level books to a younger sibling, cousin or neighbor. The books have been sorted by age range, stamped with Cooperative Extension and Molina Foundation stickers, and grouped based on their intended location: New Castle County, Kent County and Sussex County. Many volunteers were integral in helping with this process and on one day, eight volunteers sorted and placed stickers on roughly 3,000 books over the course of three hours. Making a difference Many parents know that reading with their children at home is important, as it enables them to improve communication and speech skills, excel in school, make progress in logical thinking skills and enhance concentration, Splane said. “It also helps them to learn that reading is fun,” she added. 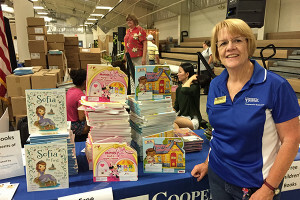 “Through this project, the Molina Foundation and UD Cooperative Extension will help expand the value that reading offers to kids.” Splane said she believes “the generous book donation from Molina Foundation allows children throughout the state of Delaware to receive quality books that will instill a love of reading. Some older children received books for younger siblings and have enjoyed reading out loud to them.” Article by Katie Russel Photos by Michele Walfred This article can also be viewed on UDaily.